Posted on November 17, 2017 at 12:10 am. This week we have been working hard to get ready for the Harvest Party and Christmas Show! Students are practicing their bucket drumming and a few other surprises for you! 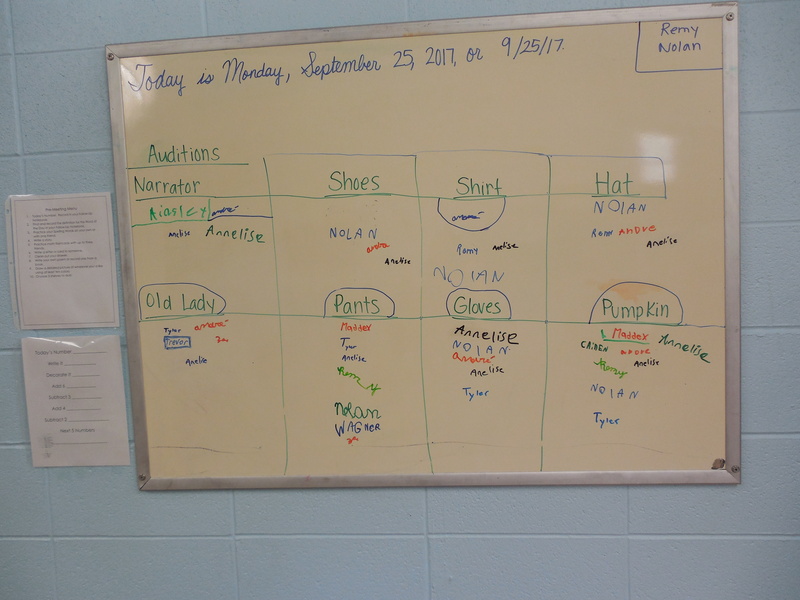 Our students discussed the Mayflower this week, then separated into groups to work on gathering information and creating a display to share with you at our Harvest Party. We added an art project to our Harvest Party decorations so students took time to disguise a turkey. Take some time to look at them in the hallway. This first year student took great pride in his Stamp Game Division work. He had a lot of exchanging to find the quotient of 5868/6. 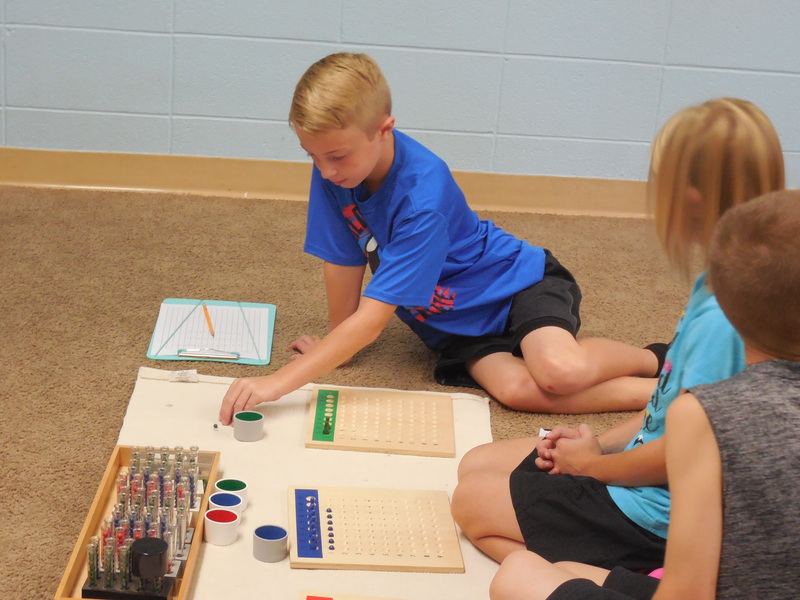 When a student becomes proficient in Stamp Game Division, they move on to long division with multi-digit divisors with the Racks and Tubes. These second year students have been introduced to the first part of the Fundamental Needs of Humans study. They are looking at the changes of the needs of humans over time. This first lesson was about the needs of early humans. Next week, they will move on to the Ancient Egyptians. 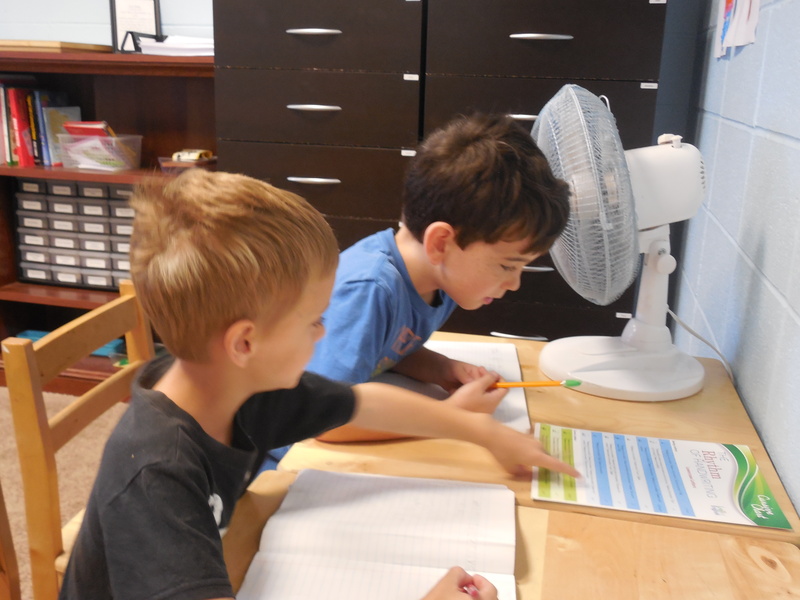 These boys have partnered together to write about life on the lower deck of the Mayflower. They researched what happened in this part of the ship and are illustrating their findings. Tuesday, we will be presenting their research at our Harvest Party. This second year student is presenting her dinosaur research. 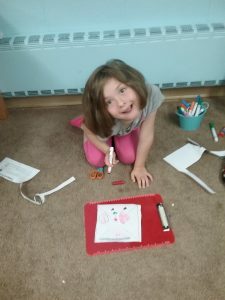 She chose to research the Tyrannosaurus Rex and Triceratops. Research not only builds many different writing skills, but gives students experience in public speaking. Next week we only have school Monday and Tuesday. We will have Spelling quizzes Monday, but will not be sending home new words until after the break. On Tuesday, we will have our Harvest Party that parents are welcome to join at 1 pm. Students will share their Mayflower and dinosaur research. After our research is shared, parents are welcome to stay and enjoy tea and treats with their student. When you have finished enjoying our research and treats, you may take your student home or return to pick them up at the usual time. Posted on November 13, 2017 at 1:19 am. 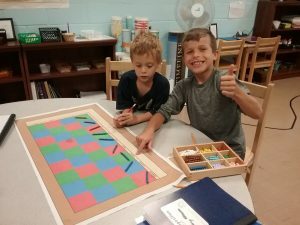 Many of you might be seeing “Checkerboard” written on your child’s work plan and wondering to yourselves, “What is a checkerboard and how is it teaching my child math?” This week, I wanted to share with you one of the most popular materials in any Montessori Elementary Classroom – The Multiplication Checkerboard. This material is used in different stages to multiply whole numbers throughout Lower Elementary and then with decimals in Upper Elementary. 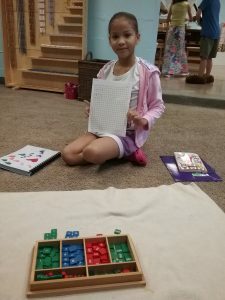 Montessori Math can be confusing to many of us because it is not taught the way we have experienced learning mathematic and geometric concepts. In most of our schooling, we were taught the quickest and shortest way to come up with the correct answer, often leading us to be confused about where a number came from and feeling like we’d never use that information again. Imagine if we had all been given the time and opportunity to discover formulas and concepts on our own, instead of solely copying down what we were told! 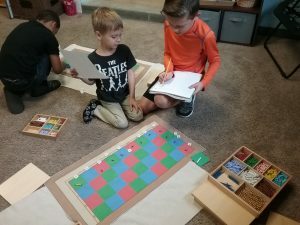 Dr. Montessori wanted her materials to help children develop a “Mathematical Mind.” This meant the goal of math in Montessori schools is not to come up with the correct answer the quickest, but to learn how to think critically and logically. The focus on math in the classroom is on the process of what they are learning, instead of the product. 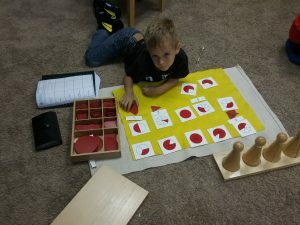 Brain research from “Math Works” by Michael Duffy, shows that Montessori Math materials engage all four lobes of the cerebrum simultaneously, connect the right and left hemispheres of the brain, and actively engage the prefrontal cortex. The first lesson with the Multiplication Checkerboard is reading numerals. Each square on the Checkerboard represents a value that students learn in their initial lesson. 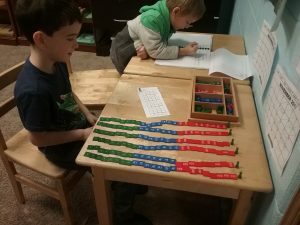 Students place bead bars in each box to read numbers into the hundred millions. 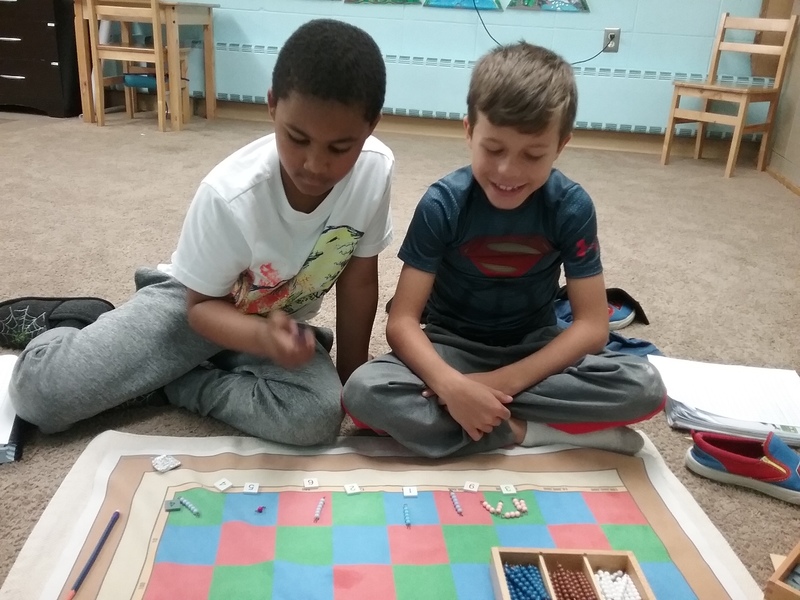 The Checkerboard is set up to use up to a nine-digit multiplicand so practicing reading large numbers is important to set students up for future success. After students are comfortable with reading large numbers, they are introduced to multiplication with the Checkerboard. Students begin with a unit multiplier. In each box that corresponds to a numeral in the multiplicand, students place the amount of bead bars the multiplier requires. For example, if the student has the equation 345,126,712 x 4, they will place four bars of 2 in the units’ place, four bars of 1 in the tens’ place, four bars of 7 in the hundreds’ place, etc. After laying out their bead bars, students will begin simplifying by adding up the bars in each square and exchanging them until there is only one bead bar in each square – their final product. After a teacher observes a student confidently and independently completing a multiplication equation with a unit multiplier, they are introduced to two, three, and four-digit multipliers. This stage of the Checkerboard takes the longest. During this stage, students are also introduced to recording partial products of their equation. This means they will complete the unit multiplier row, simplify, and record what they have. They will continue that process with the tens’ multiplier, the hundreds’ multiplier, and then the thousands’ multiplier. This part of the Checkerboard is leading them to abstractly multiply on paper. 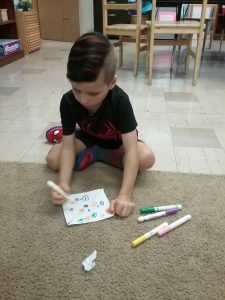 When the student is done multiplying on the Checkerboard, they add their partial products on their paper, then add the beads on the board to check their work. The final stage of the Checkerboard is abstractly multiplying. This is when a student is able to multiply solely on paper, without materials. 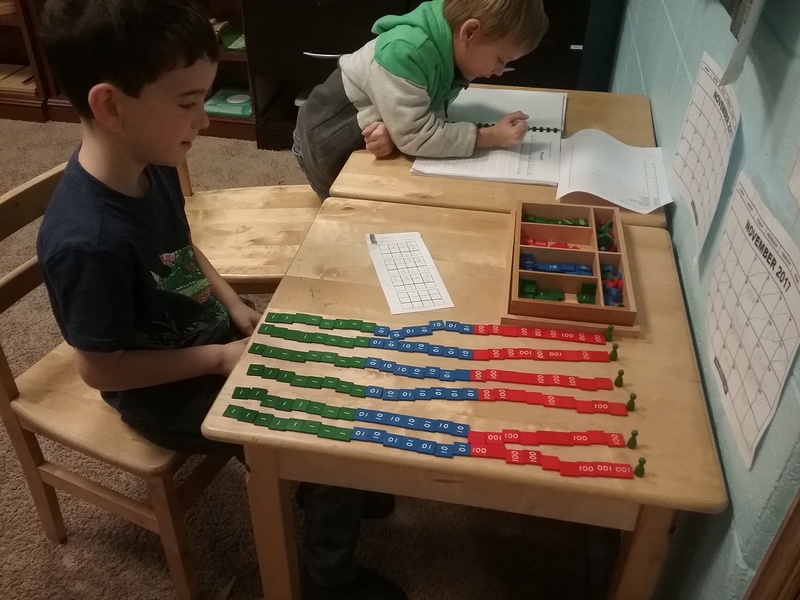 While it would be faster to just show the child this method first, practice with the concrete materials gives them a deeper understanding of what they are doing and what those numerals represent. Often the students at this stage will check the work of students still using the materials, as you see in the photo. 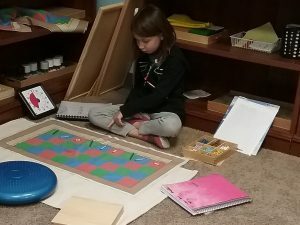 The Multiplication Checkerboard is one of the many materials in our classroom that gives your child the opportunity to learn and grow at their own pace, while being challenged. The concrete materials used in Montessori classrooms give students a deeper understanding and a sense of confidence when they come up with their own formulas or solutions to problems. Next week Lower Elementary students will talk about factoring, the fundamental needs of early humans, and bisecting angles. Upper Elementary students will look at the characteristics of cells, commas and apostrophes, and the five kingdoms. 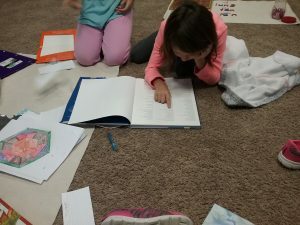 All students will work on Text-to-World Connections in Reader’s Workshop and will participate in new States of Matter lessons. REMINDERS: 11/16 OCC Packing. Information was sent home on a flyer and in email! 11/17 Parent-Teacher Conferences – This is a NO SCHOOL day for students. If you haven’t yet, you can sign up here. 11/21 Harvest Party – Parents are invited to come join us for tea and desserts. Come hear what students have learned about the Mayflower. Please arrive at 1:00 pm. More information to follow by email. Posted on November 3, 2017 at 1:38 pm. As one of our first graders said this week, “There’s no way it is already November!” We can’t believe we are already heading into lower temperatures and Christmas Show preparations! Research projects are in full swing in our classroom. First and second year students are researching dinosaurs, third year students are learning about the human body, and fourth year students are beginning cell theory and classification of early humans. We have ended our North America Continent Study and are talking about animals, musical instruments, and capitals of South America. First and second year students are diving into their Dinosaur Research. Each student chose one Saurischian dinosaur and one Ornithiscian dinosaur to learn about. They are researching the diet, habitat, size, and other facts about each dinosaur before creating a poster to display their findings. One thing students must be comfortable with before beginning research into any topic, is using the index of a book. This student is using the index to find information about her Saurischian dinosaur, the Tyrannosaurus Rex. This first year student asked to join a second year lesson about the Conventional Protractor. The concept behind measuring angles is introduced through lessons about triangles. Students then move on to using the Montessori Protractor which is a complete circle with measurements from 0 to 360 degrees. After practice with that material, students draw lines and measure their angles with a Conventional Protractor. Students that have practiced adding on paper, will add up their angle measurements to check their work. If the sum of their supplementary angles is 180 degrees, then they know they did accurate measuring. These students have been independently researching guinea pigs. They used books and the internet to complete a research template. 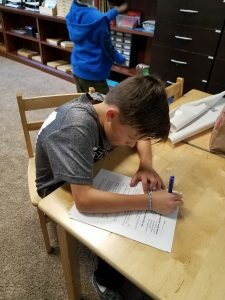 After compiling their research, they wrote a rough draft, including an introductory paragraph and a conclusion. For their final draft, they had to include a cover page and a bibliography. 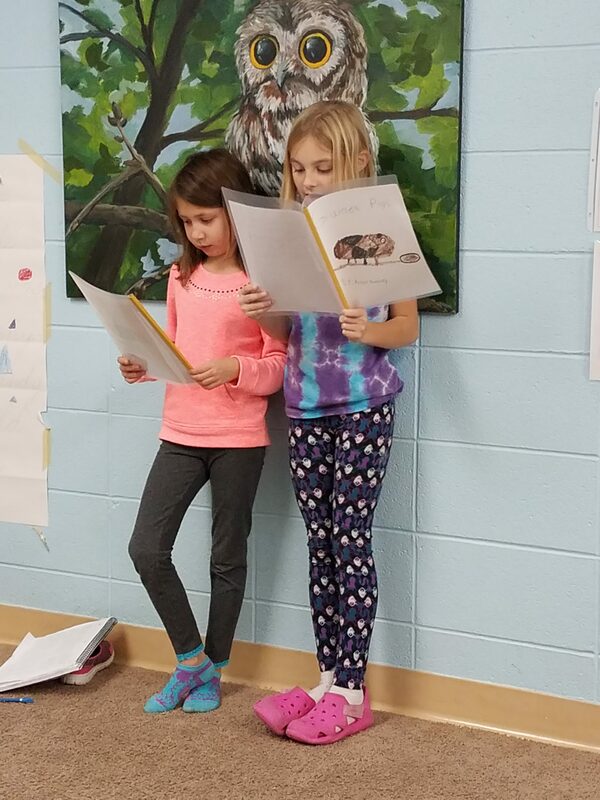 The students chose when to present their information to the class and took questions at the end from their peers. These students are working on “Button Classification.” This is the first lesson before the study of Early Humans. 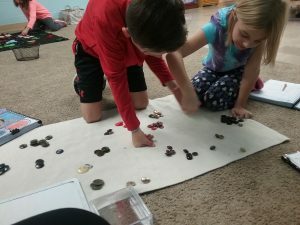 The students are given a large amount of various buttons and have to separate them based on characteristics, just like a scientist would when discovering a new species. 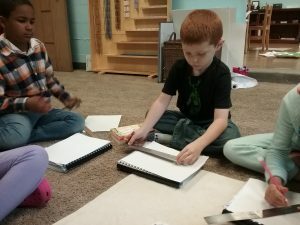 These students started with two groups: small and large. They further separated those groups based on holes in the buttons, texture, color, and other characteristics. Next week our Lower Elementary students will be continuing their research, looking at the difference between a point and a solid, and will beginning studying the fundamental needs of humans throughout history. Our fourth year students will continue learning about cells, look into different categories of pronouns, and will classify living things. Parent-Teacher Conferences are Friday, November 17. This is a NO SCHOOL day for students. Please sign up for a conference here. Posted on October 27, 2017 at 9:31 am. Our week has been good! Every student has to complete follow up work, also a math, langueage, and a cultrol! We have 13 kids and 2 teachers. Third grade lessons are mostly all of the triangle boxes. Second grade lessons are sudtracshonging angles. 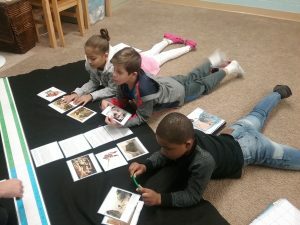 The ferst grade lessons is a dinosaur research. The fourth grade lessons is mickroscope lessons. Third graders are doing Equivalency of the Constructive Triangles. We had to put shapes together and find that they are equivalent. We had to form everything into a big parallelagram. 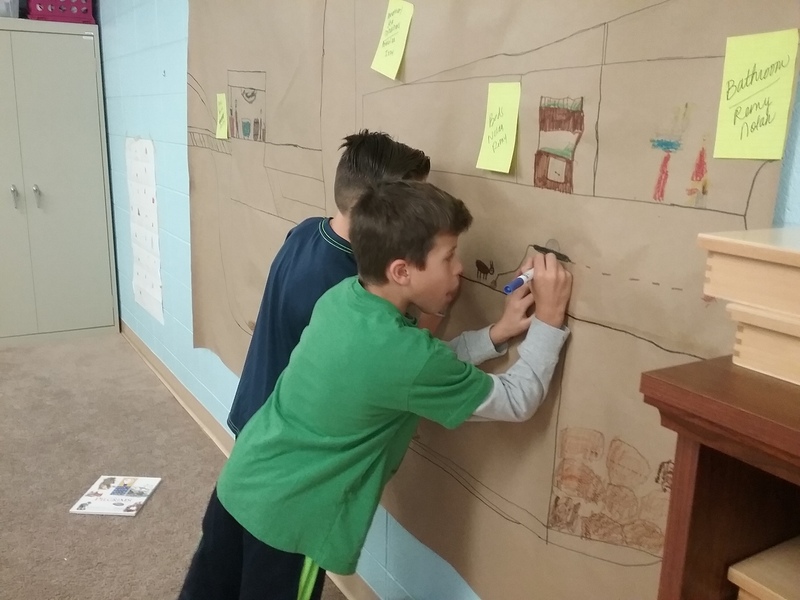 These students are doing the Naberhood Map. You are using the felt pieces to create a naberhood. Then you create a map key. 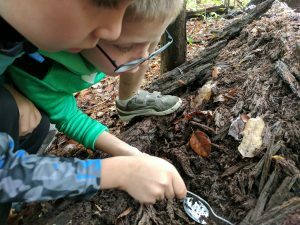 Map keys are included in the Tallmadge Circle activities. Most third graders know the Racks and Tubes, to work on division equations. 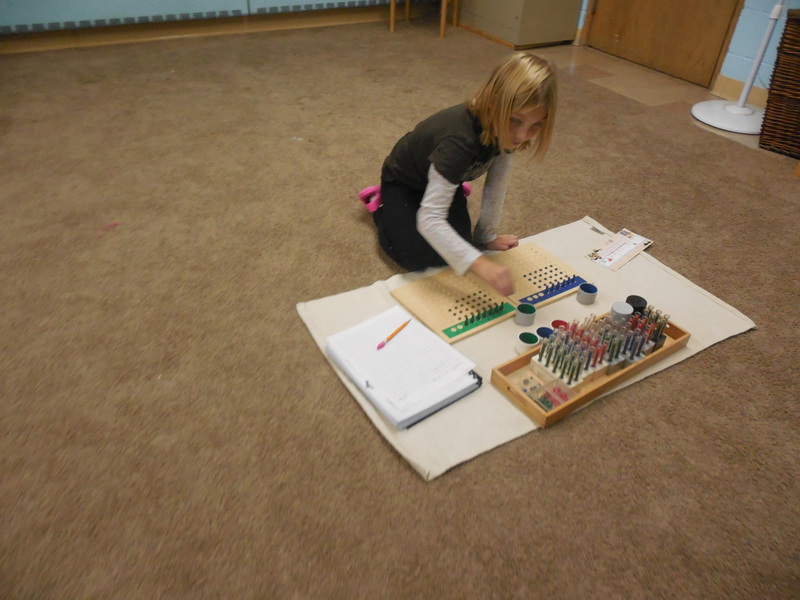 You use a board and beads to solve the equation. Then you record your answers. This is a fourth grader. He is working on the Mickroscope lessons. He is doing a mickroscope test. If you complete the test you get a mickroscope lisens. Next week we will be performing our Halloween play for the Tallmadge students and families on Tuesday, October 31, at 2:30 P.M. The students would love to see you there! We will also have our Book Fair next week! Look for your student to bring home their Wish List of books they are interested in! Next week, Lower Elementary students will begin studying the Fundamental Needs of Humans, multiplying on our Checkerboard, and will add fractions with like denominators with sums greater than one. The Upper Elementary students will begin their study of Early Humans and will take the area of plane figures. Posted on October 20, 2017 at 1:30 am. 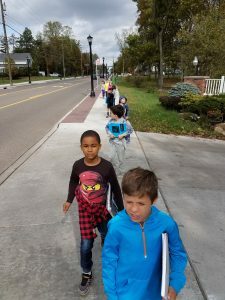 We were so excited to end last week with a walking field trip to Tallmadge Circle. This week we had parents visit for “Bring Your Parents to Work Time,” continued to practice our play, and enjoyed a new science experiment about decomposers. 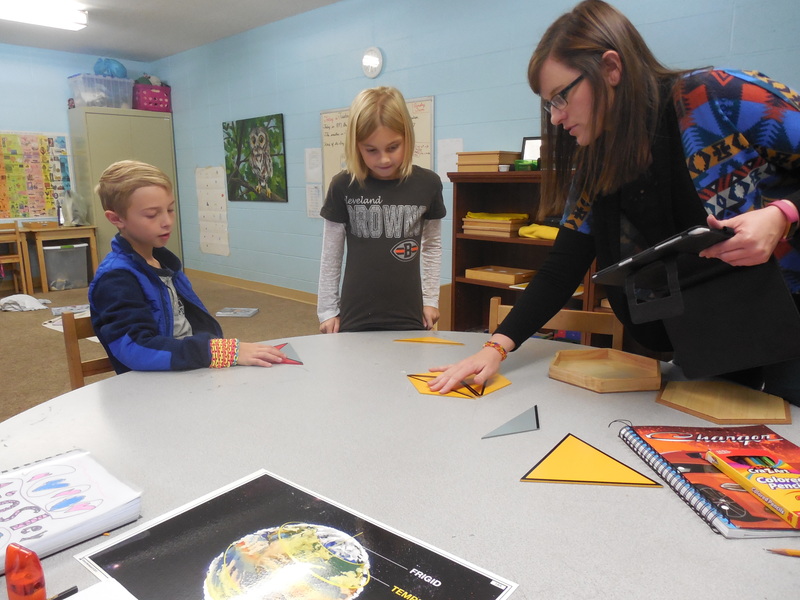 This week, Lower Elementary students worked with the Small and Large Bead Frames, measured in grams, discussed the Mesozoic Era, and worked with the Constructive Triangles. Upper Elementary students worked with multiples, homonyms, prepositions, and angle word problems. On our walking field trip to the Tallmadge Circle, students had to practice safe walking rules by staying together, staying on the sidewalk, and being aware of their surroundings. We also discussed the purpose of crosswalks. While at the Circle, students sketched each direction around the circle. They had five minutes to sketch each direction. At school this week, the students are putting their sketches together around a circle, representing where we were sketching, drawn on a poster board. 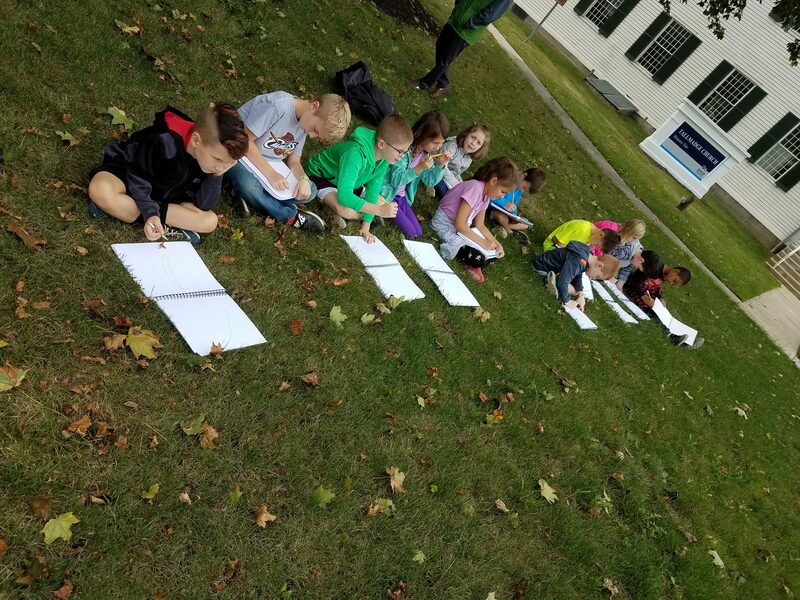 They will color these sketches, add a compass, and a map key to complete their map of the Tallmadge Circle. Look for a Remind message about when these will be available for display. 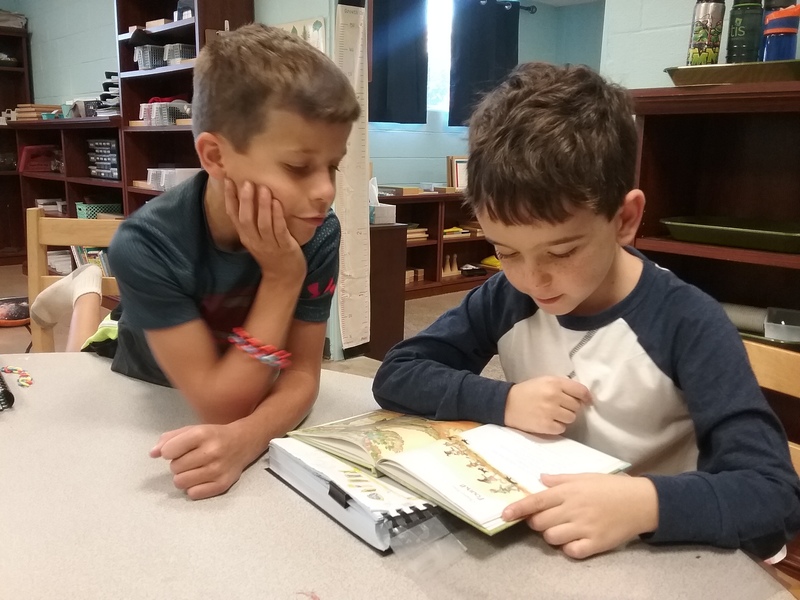 These students are helping each other in reading group. This reading group came up with the rule of raising your hand if you know a word someone is struggling to read, instead of just telling them. This gives the child an opportunity to sound out a word or choose to get help. One of our favorite things to see in our environment is students coming up with solutions to problems without a teacher’s help. First and second year students are beginning to study dinosaurs. 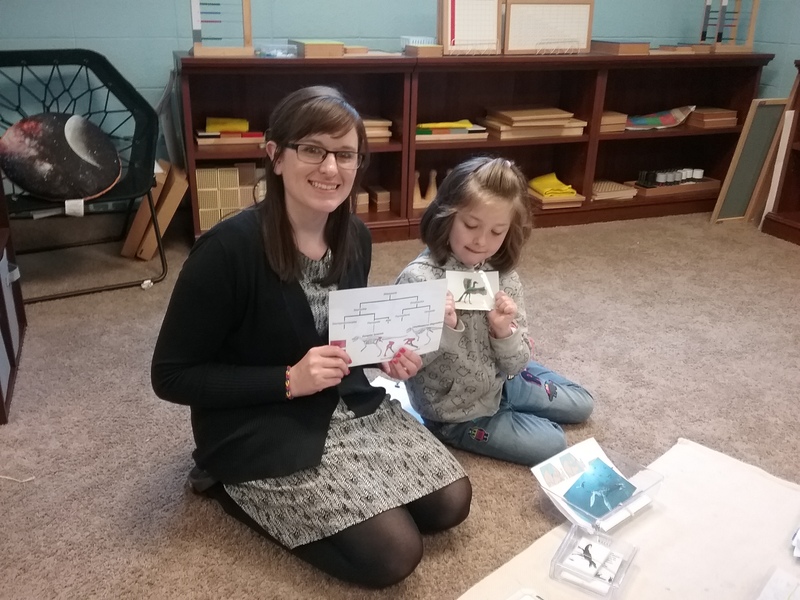 This first year student knows a lot about dinosaurs already, so she joined me to present the lesson and information to the other students. Before this lesson actually took place, we had to plan together which one of us would talk about certain things and how we thought the lesson should go. 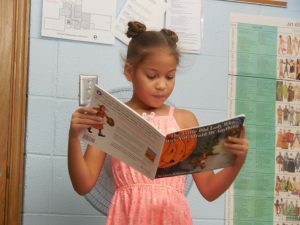 During the lesson, this student practiced her public speaking skills and gained a lot of confidence! During one of our “Mindfulness Moments” this week we tried Deep Listening. 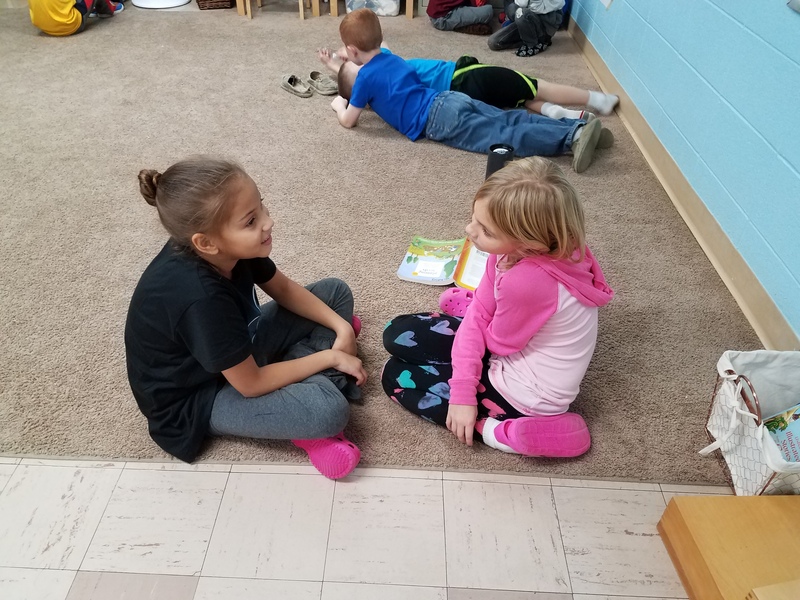 We discussed how you know someone is really listening to you, how it feels when someone takes the time to really listen, and how we can practice that with our friends and family. After our discussion, we partnered up to share something that we’ve struggled with, something we are looking forward to, or how we were feeling. Elementary students often struggle with feeling like they are not being treated fairly or not fitting in. One way parents and other friends can help is to take the time to truly listen, even if the conversation seems insignificant, and give examples of when you’ve felt that way and how you’ve handled it. These third and fourth year students had a blast measuring angles with a protractor. They taped angles onto (and under) our science table, then used dry erase markers to record their measurements. The Montessori classroom allows students to spend more time on work they are interested in, instead of only allowing a certain amount of time per subject. Although these students appear to only be working on Geometry, they are also learning to work together and delegate tasks. They spent two days on this project! 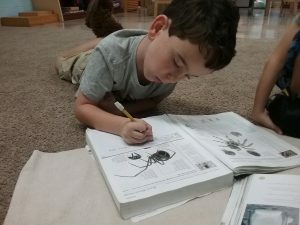 Next week Lower Elementary students will continue their dinosaur research, practice writing different lengths, learn about proper adjectives, and talk about surface tension. Upper Elementary students will change improper fractions to mixed fractions, work on commas as interrupters, practice note taking, and finish their review of prehistory. 10/25 All Halloween Party supplies should be dropped off by this date. 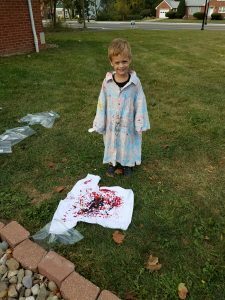 10/27 Halloween Play and Party – Remember to drop your child off at the Cuyahoga Falls Campus by 8:15 in regular clothing. Children will change into their Halloween costumes when we return to the Tallmadge Campus. They will need the regular set of clothing for gym this day. Posted on October 13, 2017 at 3:47 pm. Leaves and towers and buses! Oh my! 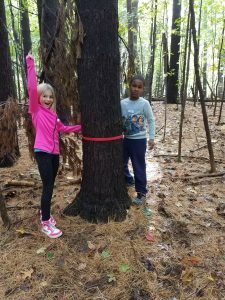 The Holden Arboretum trip was a blast! Many of our students enjoyed their very first bus ride, while older students had fun teaching bus games. 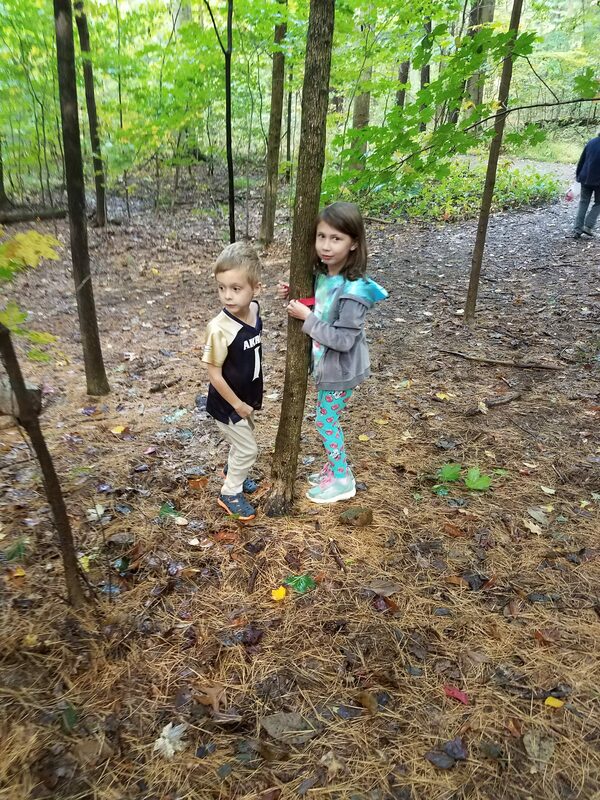 We were able to learn about different leaves and trees, catch wildlife that lives in the arboretum, and walk through the canopy. During our work time this week, first, third, and fourth years worked with different extensions of the Constructive Triangles. 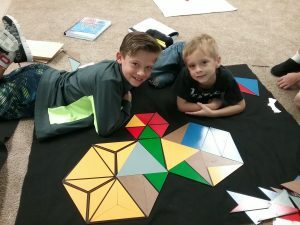 First year students transformed the blue triangles into new shapes. Third year students explored equivalence of the shapes inside the Small Hexagonal Box. Fourth year students found equivalence between different parallelograms, squares, and rectangles with our Euclid’s Theorem Drawer. Second grade students had their first look at our Geographic Feature Cards to learn about caves, icebergs, fiords, and islands. This month, students are focusing on Composition of the Earth experiments. This experiment is about the density of solid objects. This experiment has a pot filled with sand. In the pot are iron objects, ping pong balls, and other plastic objects. Students push all objects to the bottom of the sand, then shake the pot to see what happens. The iron objects sink and the plastic objects rise to the top. Students can conclude that denser objects settle under substances or objects that are less dense. These first and second year students are completing their constellation viewing tubes. Students have poked holes through printed constellations and glued them to tubes to be able to view the constellations in the light. Other students have decided to paint constellations or poke holes in a sheet of paper to use to cover a light! There has been a lot of creativity with this project! 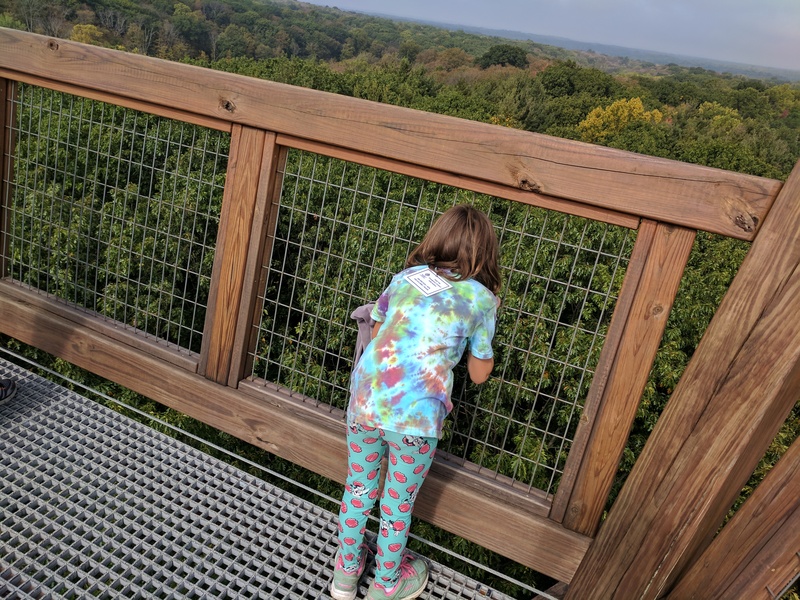 One of our favorite parts of the Holden Arboretum trip was the Canopy Walk. 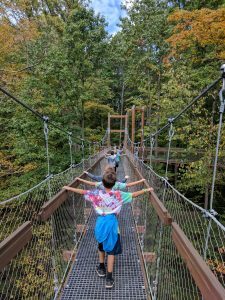 This Walk was 500′ long and 65′ above the ground. We were able to walk through the canopy of the forest to see a different perspective of the trees and animals. 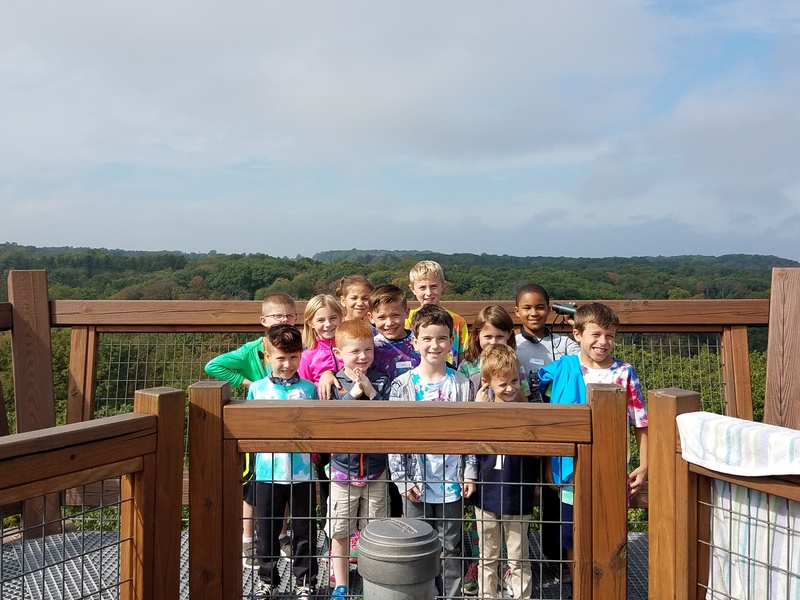 Here, our students are on top of the Emergent Tower, 120′ above the ground! Our students were nervous as they climbed higher and higher, but everyone made it to the top! The view was amazing. These students are searching for live and dead forest material! 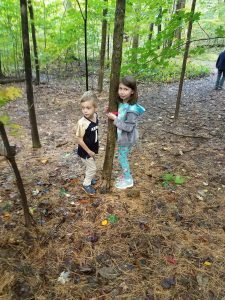 One of our activities at the Arboretum was finding the age of trees. 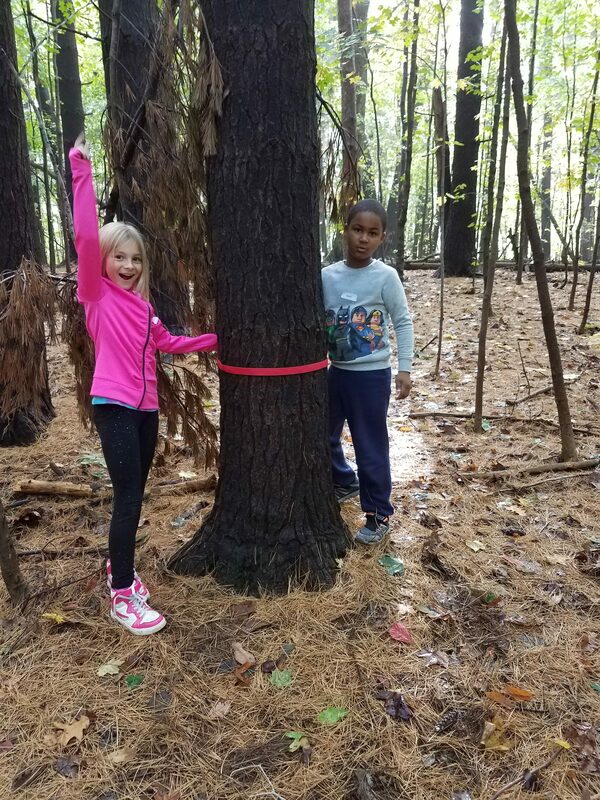 Partners were given ribbons of differing lengths and were sent to find the tree it fit around. Our guide told us there is a mathematical formula for finding the age of live trees based on diameter. This formula changes based on type of tree. 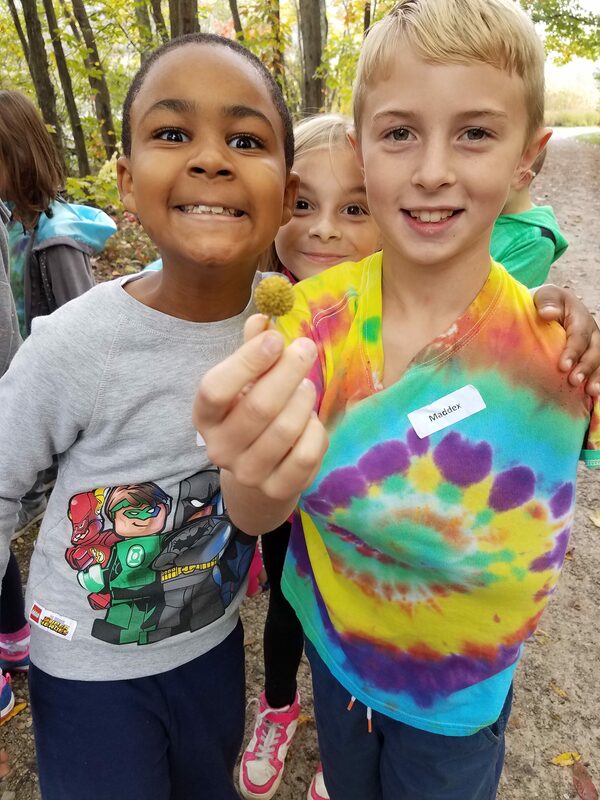 These students are holding the fruit of a Buttonbush. These fruits were used on clothing as actual buttons! 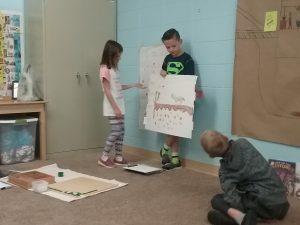 Lower Elementary students will be working on small and large bead frames, beginning dinosaur research, adding angles, and studying the layers of the Earth. 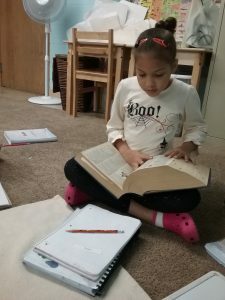 Upper Elementary students will study homonyms and prepositions, will explore the rules of electron clouds, and work through angle word problems. REMINDERS: Next week we have our first “Bring Your Parent to Work Time” Days. If you are signed up, you will receive an email reminding you of your time, with some information to review. Posted on October 6, 2017 at 4:26 pm. I can’t believe it’s already the first week of October! The students have accomplished so much in such a short time. 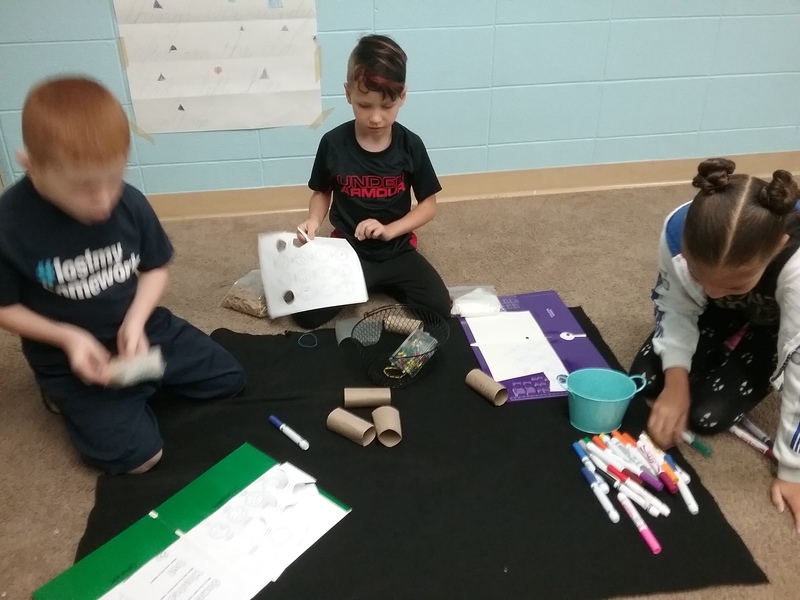 All students discussed the differences between prehistory and history, made constellation tubes from your donated toilet paper and paper towel rolls, and practiced summarizing. This week first graders practiced math facts with the Addition Snake Game, had their first experience with Geometry Proofs, danced like molecules, and discussed density of objects on Earth. Our second graders began adding fractions with like denominators, added to their editing repertoire with inserting punctuation marks, and practiced finding good information for research. 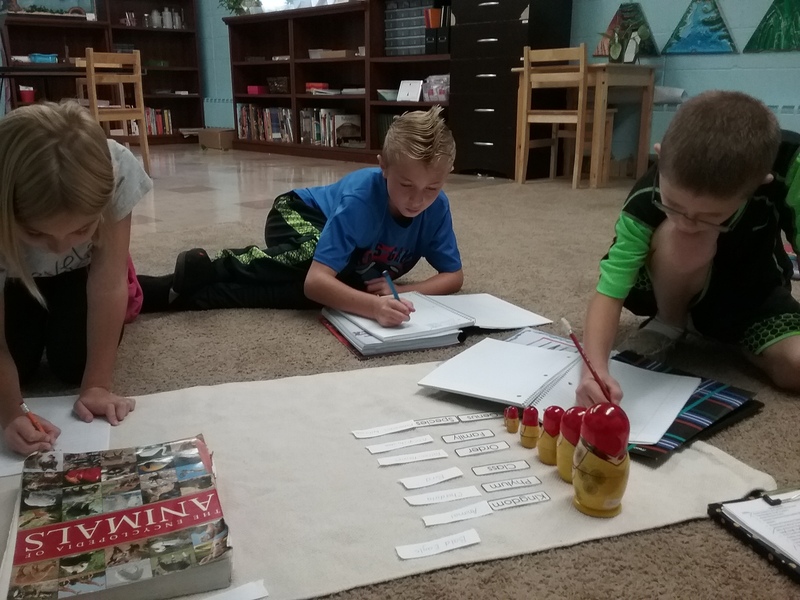 Third grade students measured using fractions and decimals, reviewed the use of the thesaurus, discovered equivalence of the constructive triangles, and found main characteristics of Porifera. 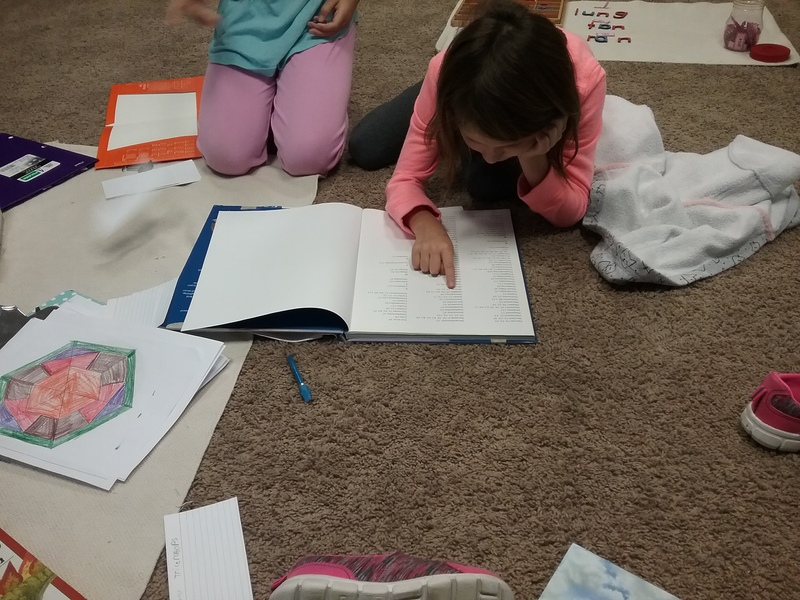 The fourth grade students solved word problems about currency, learned about daffynitions (coffee – someone who is coughed upon), discovered relationships of angles in Euclid’s Theorem, and practiced proper adjectives. We spent time together this week practicing our play that we will perform for the Primary students at both campuses, trying papaya, and using a drill! Elementary Montessori students do a lot of research throughout their six years with us, both independent and assigned. To help students feel successful, first year children are introduced to many research skills. These students learn how to use an index and table of contents, how to avoid plagiarism, how to determine if information is useful, and how to organize their information. This first grade student is recording research about Black Widows onto a research note card. This card must be labeled with the title, author, publisher, and copyright date for later use in a bibliography. 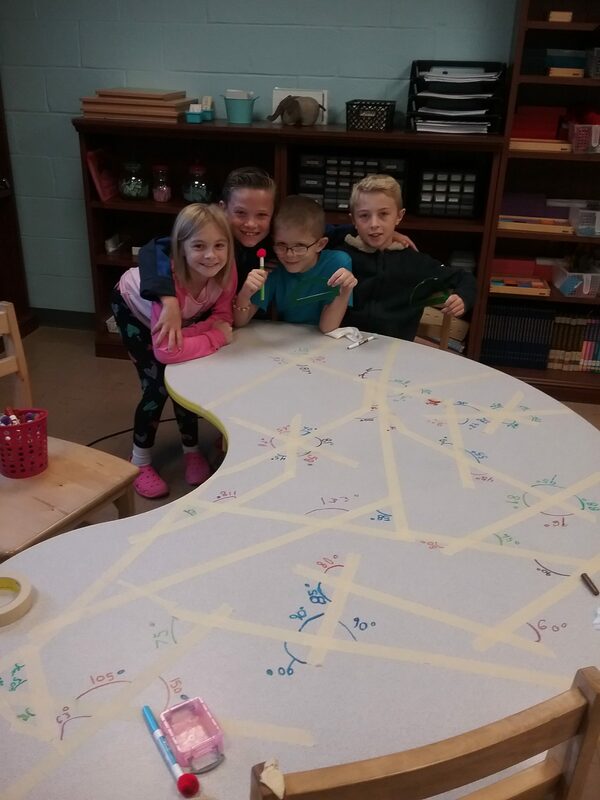 One of our Spelling choices this week was “Michelangelo Write.” Students that chose this activity had to tape their paper to the bottom of a table before writing their words three times each. 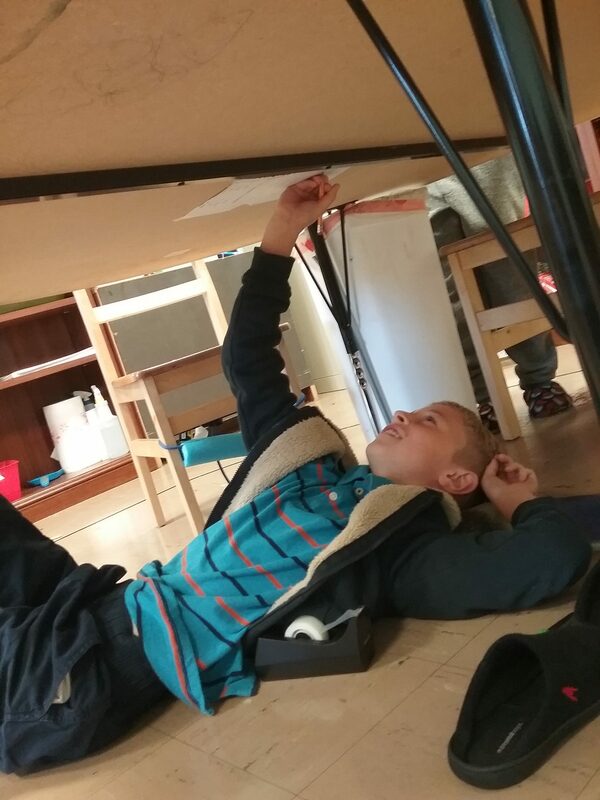 It was quite a sight to see students working on and under tables! Using a pumpkin from our Ramseyer Farm trip, students had their first chance to use the drill this year. 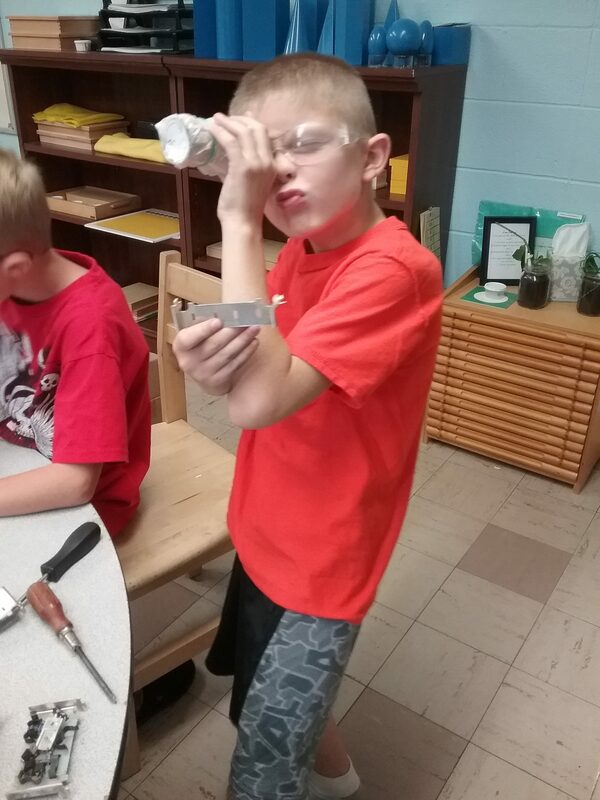 Before using the drill independently, students had to learn how to insert the drill bit, how to put on and remove the battery pack, how to lock the drill, and how to drill forward and in reverse. 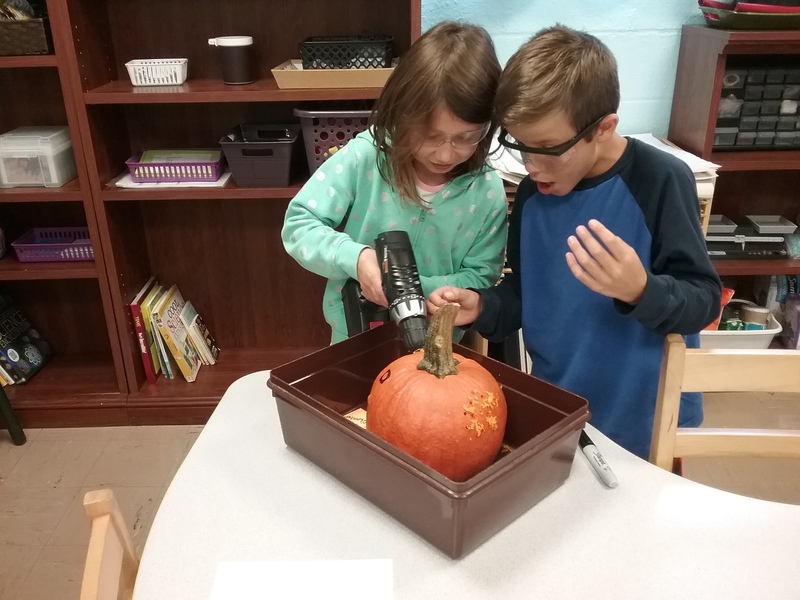 Some students drew faces on the pumpkin before drilling out the shapes to make a jack-o-lantern. This fourth year student and a third year student wanted to practice estimation by estimating the amount of books in the entire school. They counted books in our rooms, Ms. Courtney’s room, the office, and the storage room, which is a separate self storage from the storage companies in Leicester. 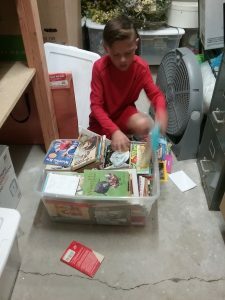 Their estimation was 1,001 books and the final count was 1,091. 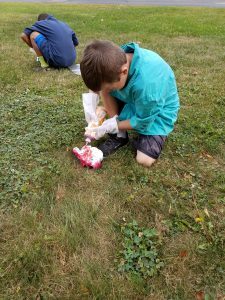 Thanks to your help collecting toilet paper and paper towel rolls, we were able to make constellation tubes. We began our work by defining the word “constellation” and sharing what we already knew. We looked at drawings of common constellations and then made our tubes. Students had to label their tubes with the name of their constellation and poke holes in the paper on top to form the constellation. You can see it if you look towards the light or shine a flashlight through the tube. We also have constellation cards on the shelf for students to practice their sewing skills! Next week Lower Elementary students will discuss end punctuation, different types of measurement, indenting a paragraph, leaf veins and plant stamen, and will begin studying North America. Upper Elementary students will begin decimal studies, continue exploring Euclid’s Theorem, and work with the microscope. We have our first bus field trip on Tuesday, October 10, to Holden Arboretum. 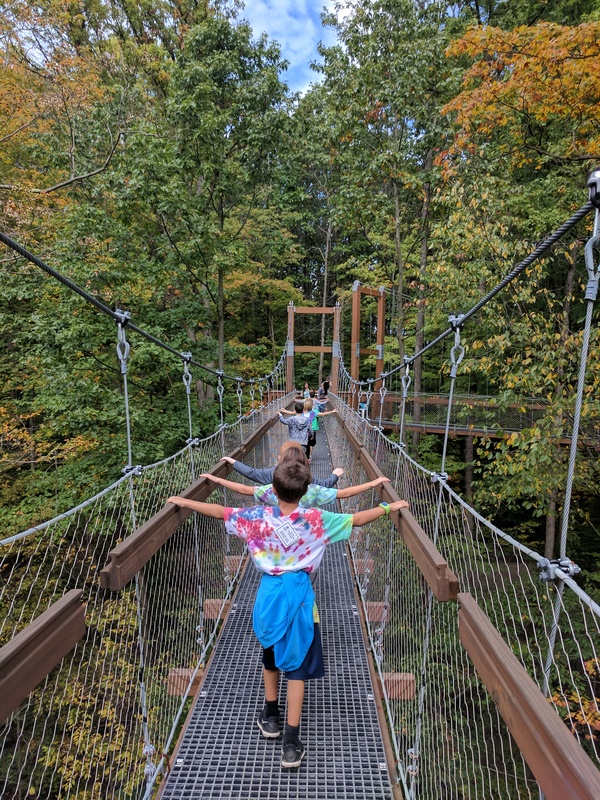 While there, we will learn about plants and animals of Ohio and try their Canopy Walk! Please dress your child for a day outdoors and send a disposable lunch. Please sign up for the Parent Education Night (10/25) about preparing your child for success now and in the future. You can sign up for the workshop here. Posted on September 29, 2017 at 2:12 pm. This week the first year students learned the artical. The second year students learned AM/PM. The fourth year student learned the noun folder. 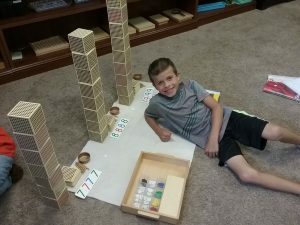 He also learned Estimation. This week the 2nd, 3rd, and 4th years learned the yarn timelein. This student is doing Spelling. His activities are write your words three times in cursive and write your words one time in bubble letters. Spelling helps with research. These students are lerning racks and tubes 3 digit division. The next step of this is division on paper. 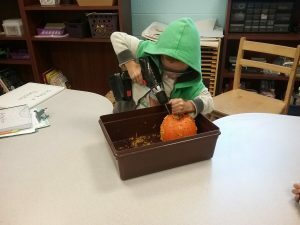 This student is doing science. 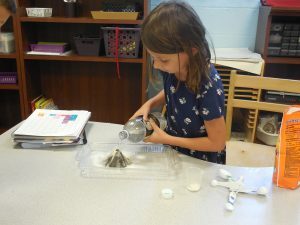 She is practicing the volcano. Next week, Lower Elementary students will be taking a deeper look at the Timeline of Life. First year students will discuss capitalization and the Dance of the Molecules. Second year students will edit sentences, measure angles, and discuss how animals satisfy their needs. Third years will discuss types of sentences and the main characteristics of Porifera. Fourth years will work with direct objects and will begin studying multiples. All students will study the compass and map keys. Some students will travel to Tallmadge Circle to complete their compass work! REMINDERS: Picture Day is Tuesday, October 3. There will be no gym Friday, October 6. Posted on September 22, 2017 at 6:07 pm. This was an exciting week in our classroom. 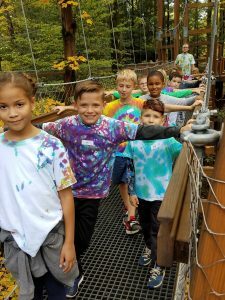 We tie dyed shirts, had our first Latin class, and are going on our first field trip! This week first year students began adding to their research skills by learning to alphabetize, discussing how to use a table of contents and index, and practicing how to paraphrase words to avoid plagiarism. 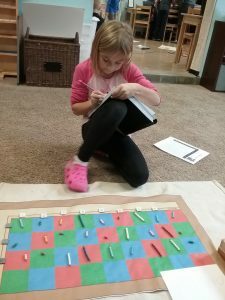 Second year students practiced reading numbers on the Large Bead Frame, reviewed common and proper nouns, and looked at consecutive and adjacent line segments. These students discovered there are consecutive and adjacent line segments in many of the letters of the alphabet! 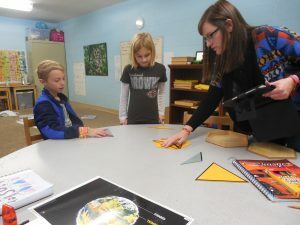 The third year students reviewed rules for plurals of nouns, practiced greater than, less than, and equal to with fractions, looked at types of corolla, and explored similarity in geometry. Fourth year students discussed words coined by famous authors, looked at the history of the English language, created their own Multiplication Checkerboard, and discussed evolution of life theorists. 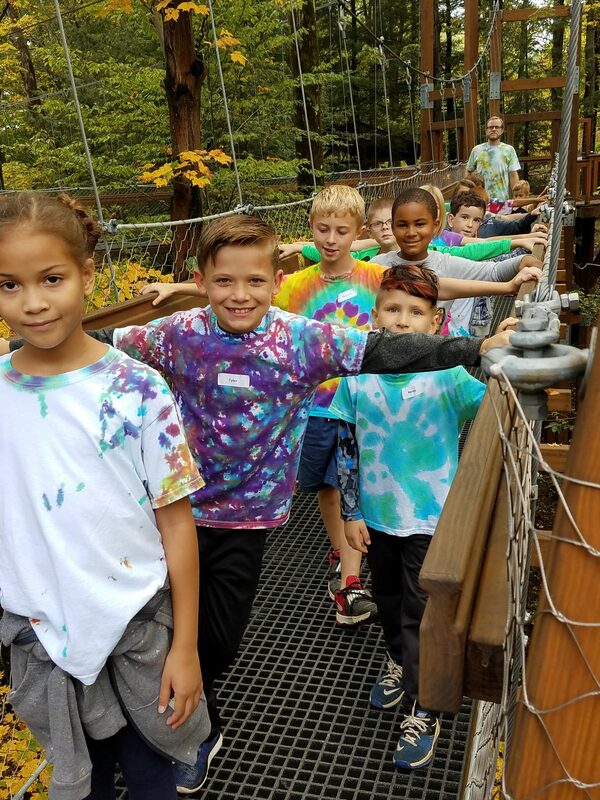 Our students made their own tie dye shirts for our field trips this year. 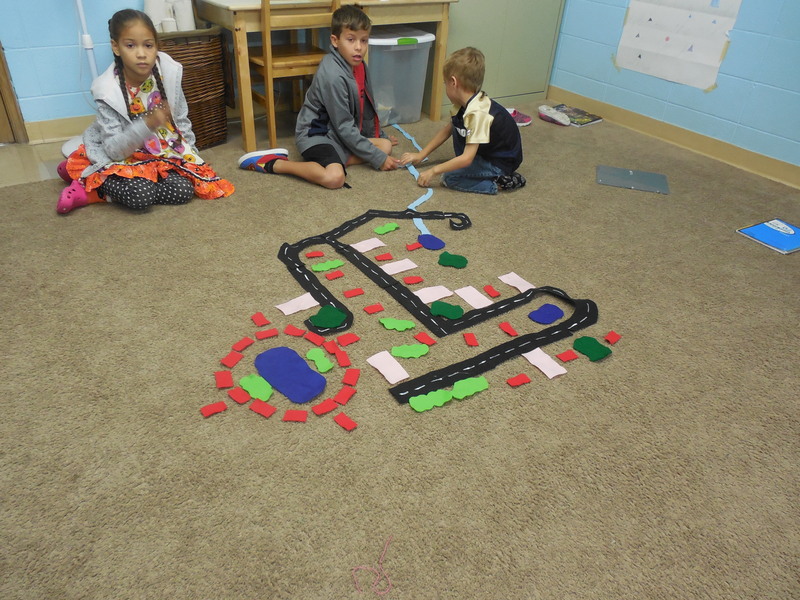 Some students followed the directions to make certain patterns, while others created original designs! Our students are conducting an experiment about germs. 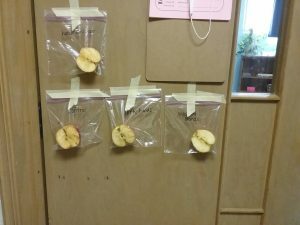 We used two apples for our experiment. Half of one apple is our control and the other half was touched by students with dirty hands. 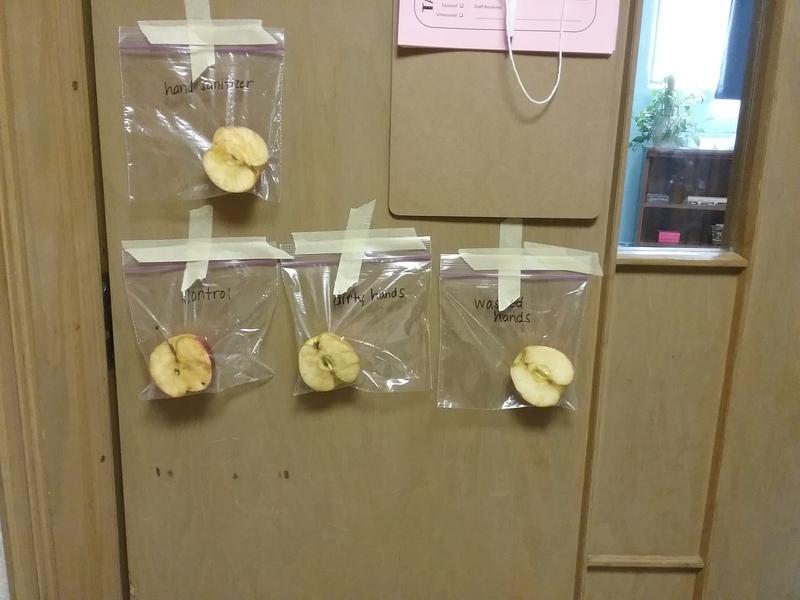 The first half of the second apple was touched by students that washed their hands and the second half by students that used hand sanitizer. So far, the apple touched by students with clean hands has changed the least. The students are so interested to see our final results. Take a peek at drop off or pick up! These students are working to read numbers on our Multiplication Checkerboard. Students add beads to the squares and read the numeral they have created. These students made the number 999,999,999. After practice with this, students will begin multiplying on the Checkerboard. This student is doing subtraction on paper with the Stamp Game. 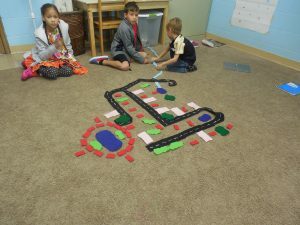 In the Elementary classroom, students learn math concepts with our concrete materials. When they have mastered that material, the next step is solving an equation with the material and on paper, with pencil. The final step is complete abstraction of the concept, just on paper. This process leads to a deeper understanding of the “why” of math work. For International Peace Day, we discussed different peace makers and world changers. After our discussion, students made peace pinwheels. 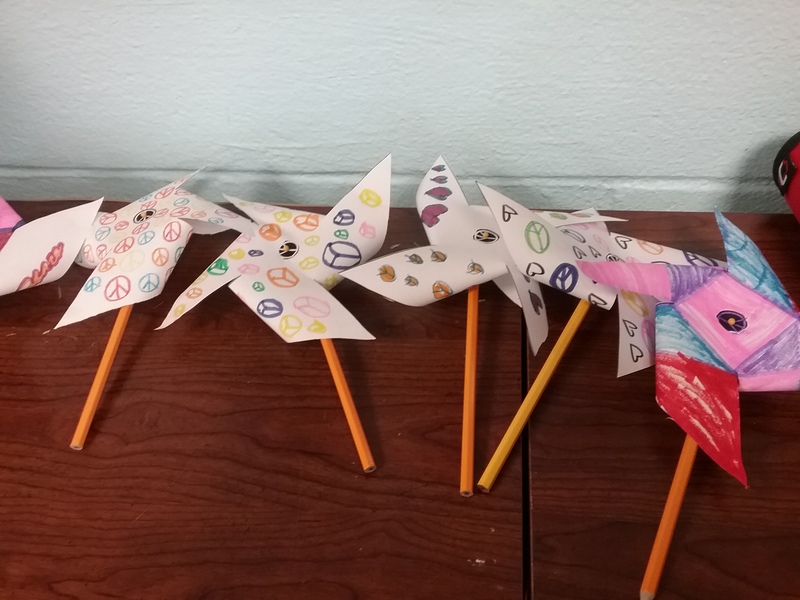 On one side of our pinwheels, we wrote what peace means to us and decorated the other side before turning them into pinwheels! Check them out near the playground before the weekend! Next week Kids Bop begins! 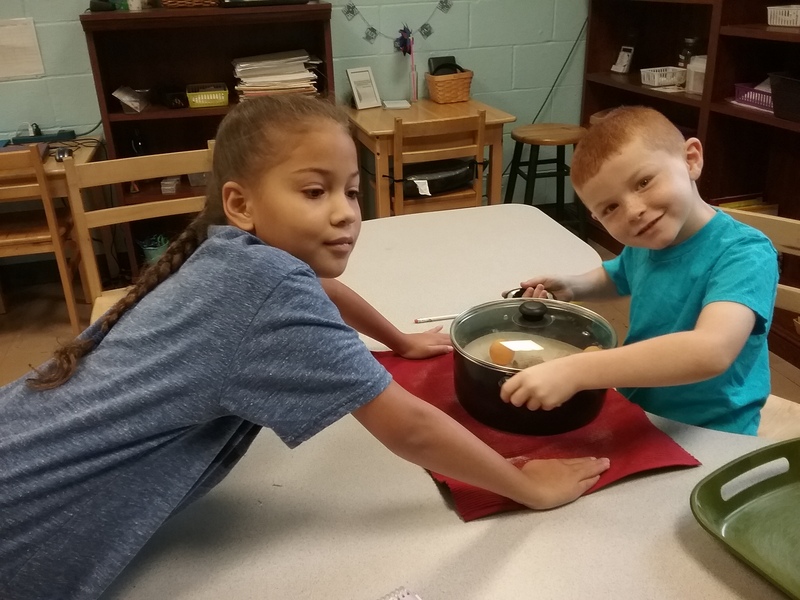 Lower Elementary students will make bar graphs, continue studying nouns, look at parts of a fruit, and experiment with an overflow basin. Upper Elementary students will work on word problems about money, practice note-taking, draw angles with a protractor, and will discuss ions and electron shells. Next week the blog will be written by two students! Don’t miss a look into our room through their eyes! Posted on September 15, 2017 at 2:56 pm. This week was filled with so many firsts! 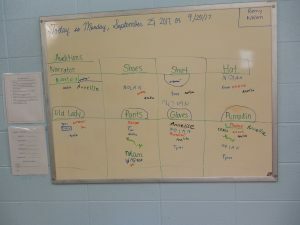 We had our first Taekwondo Demo, our first Spelling lesson, our first Handwriting lesson, our first Dance Demo, and our first Gym class! In between these exciting events, students have been independently researching and working with our materials. This week first year students worked with fractions, compound words, nouns, circles and other curved figures, and heard a story about “The Gift of the First Plants.” Our second year students practiced the ideas of greater than or less than, feminine and masculine nouns, oblique and perpendicular lines, and classification of the animal kingdom. Third year students worked on suffixes, congruence of shapes, taxonomy of vertebrates, and practiced adding and subtracting squares and cubes of numbers. Fourth year students had their first Writer’s Workshop, worked with acronyms and articles, practiced the Pythagorean Theorem, and built models of the molecules that make up our Earth’s atmosphere. This second year student is comparing three numbers to determine if they are greater than, less than, or equal to each other. Students know from work with Alphabetizing, that they need to look at the first letter, or in this case the largest hierarchical place, then move to the right to compare these numerals. This work prepares children for self-checking of math equations. For example, if they notice their remainder in a division equation is greater than the divisor, they know to go back and find their mistake. 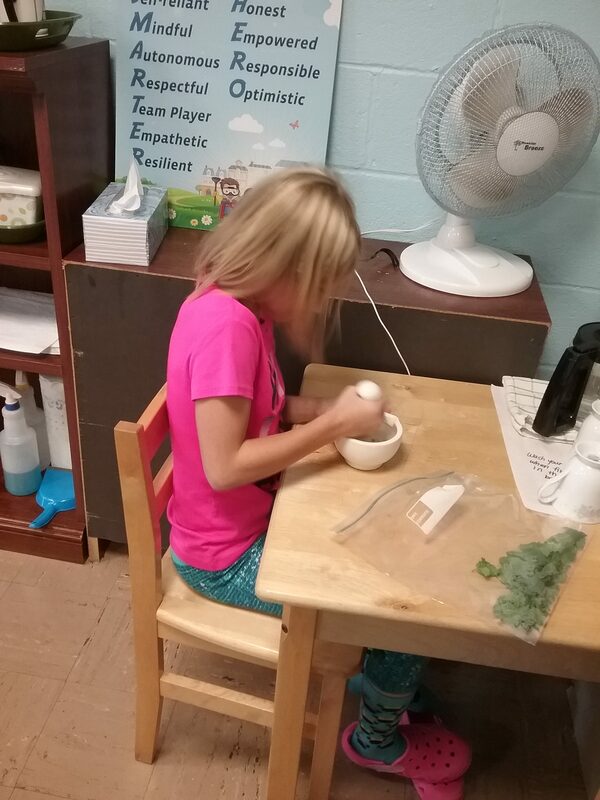 This student is grinding mint leaves to make tea. 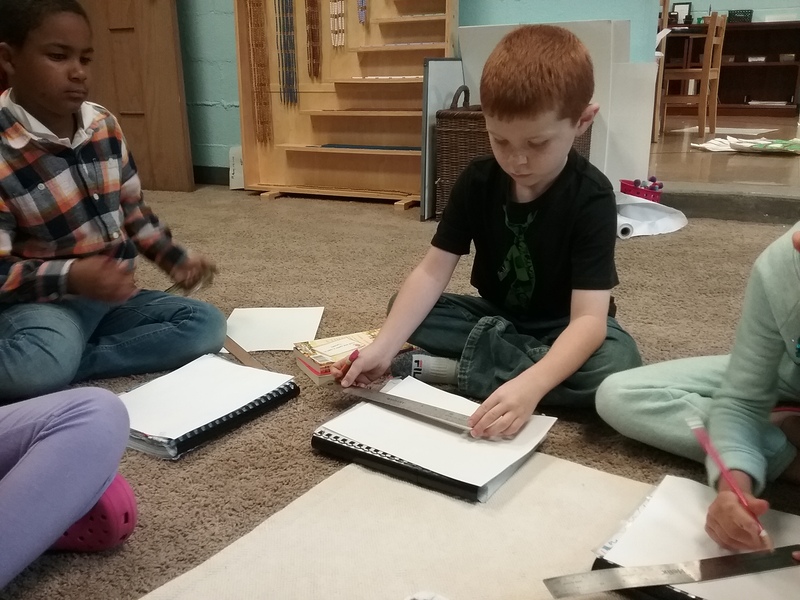 Practical Life in the Primary Classroom enables preschool and kindergarten children to be more independent and prepares them to read and write. 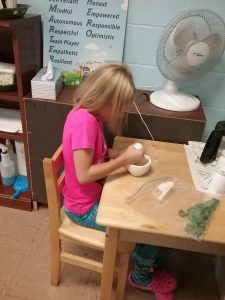 In the Elementary Classroom, Practical Life often includes more challenging life skills – sewing, chores, making tea/coffee to serve to a guest, using tools, and self-care. This first year student is matching fraction cards with pictures and written fractions to the fraction inset pieces. This prepares the child for adding, subtracting, multiplying, and dividing fractions with our insets. This fourth year student has been reviewing the Pythagorean Theorem with a scalene right-angled triangle. After using the Constructive Triangles to build equilateral triangles on the legs and hypotenuse of his first triangle, he discovered that the Pythagorean Theorem also works with hexagons. This first year student was interested in the lesson and helped complete the hexagons! These third year students are recording the taxonomy of a bald eagle. We use the nesting dolls to demonstrate the idea of starting with the largest, most broad topic – the kingdom of the living thing, then moving to the most detailed classification – the genus and species. Next week, all students will begin Latin and participate in Zoology experiments. Lower Elementary students will be practicing telling time, learning about the life cycle of a star, and discussing how to use a table of contents and an index. These students will also learn how to avoid plagiarism in research reports. Upper Elementary students will hear about words coined by famous authors that we still use today, discuss the history of the English language, and use a yarn timeline. 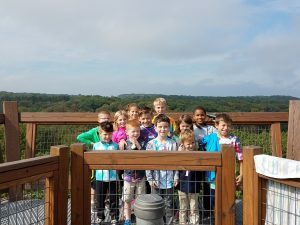 REMINDER: Ramseyer Farm Field Trip Friday, September 22. Please make sure your child is in tennis shoes and is dressed for the weather. Please send lunches in a disposable container with disposable items. We will be unable to warm up leftovers at the farm.